This page will evolve as more information is added. 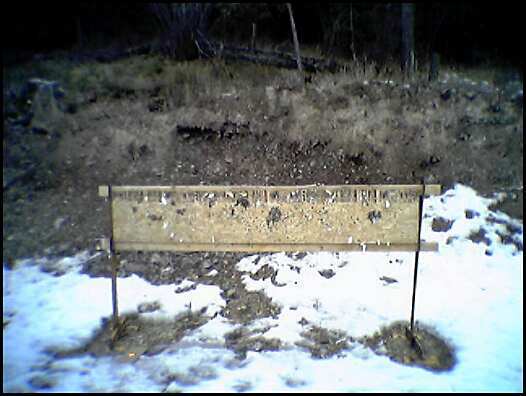 We wish to offer some shooting range construction techniques that have proven successful in Montana. Gong Tree. 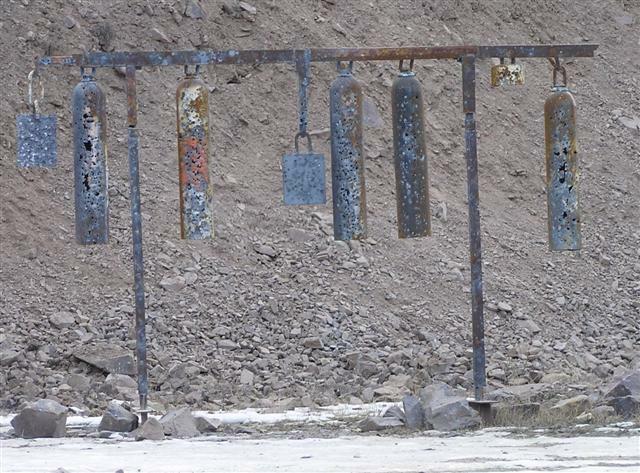 Shooters love to shoot at a Gong Tree. This one is made with decommissioned (bottoms cut off) high-pressure gas cylinders, hung on a rack. Sometimes outdated cylinders are available for free or scrap price from gas suppliers. Prone shooting platform. This platform gets a lot of use, and is also useful for training young shooters. It is a six-foot by eight-foot waferboard box, with carpet padding and indoor/outdoor carpet, anchored to the concrete pad. 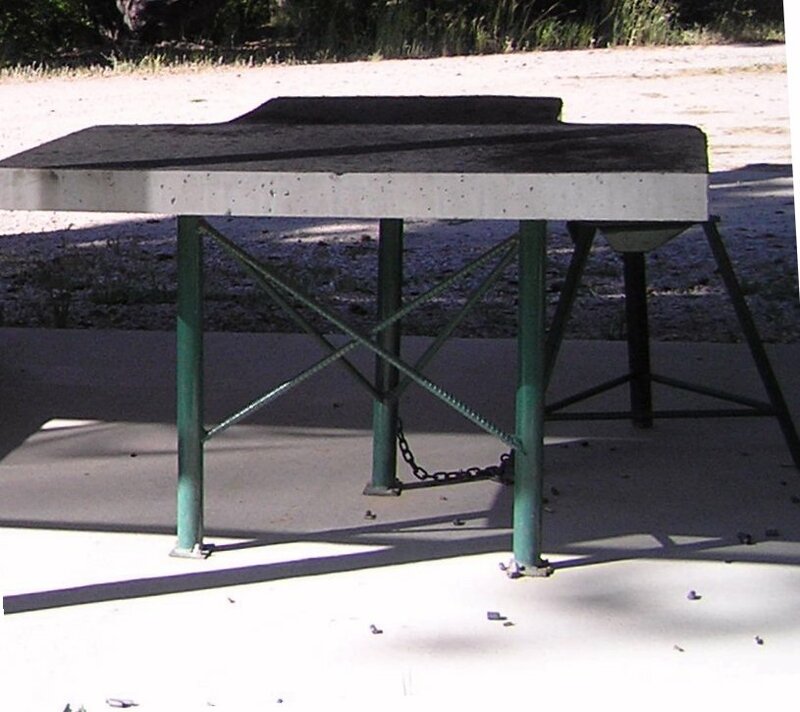 Concrete shooting benches. 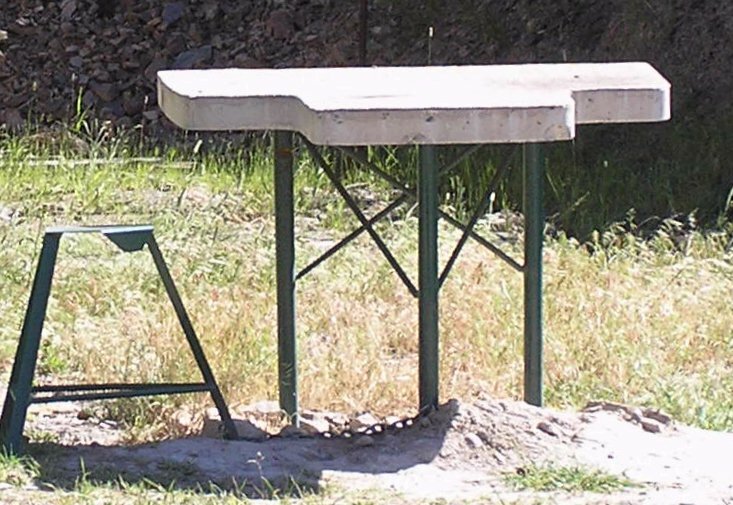 Shooting bench tops made of poured concrete are very stable to shoot from. A local concrete casting company can probably pour these for you. You or the contractor will need to make a form from 3" or 4" flat metal strap, or braced Masonite (metal lasts through more pours). You will also need to make "imbeds" (a square steel plate with a short piece of rebar welded to it) for the underside of the top, to weld the pipe legs to. Legs can be 1 1/2" schedule 40 pipe, with a holed flange welded on the bottom to bolt the legs down to a concrete pad. 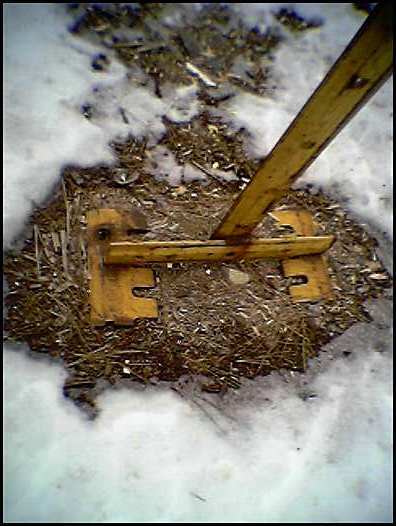 Be sure to brace the legs with diagonal rod or rebar welded to the legs. After installation, glue indoor/outdoor carpet to the table top. Effective firing line cover. 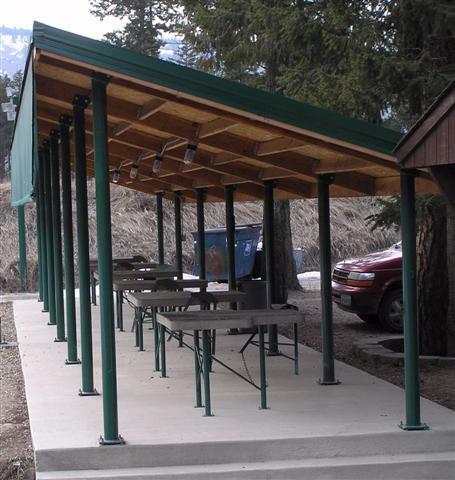 This cover is constructed with 4" pipe legs bolted to imbeds in the concrete pad. The roof is wood frame, covered with wafer board and corrugated metal roofing. The pitch of the roof is steep, because the most cost-effective way to mitigate excessive sound under the cover is to tip the roof up to reflect the sound out of the confined space. The posts in the back are about 9' tall, and in the front about 11' tall. Because of the height of the roof front, a screen is hung from the front to shade the shooting benches and to intercept blowing rain. Particle board is cheaper than wafer board, but blows out quickly - doesn't last very long. 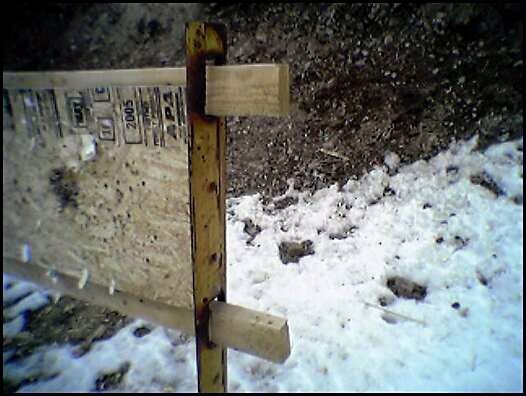 Sometimes building supply outlets will donate or offer a reduced price on wafer board that has damaged corners or edges. Ask your local supplier to save any damaged goods for you. To freshen these target backers, just replace the wood. The stands will last forever. 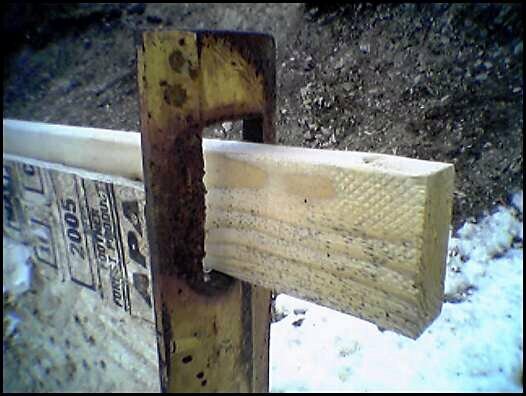 Caution: There was one observed instance where a pair of these stands were struck by ligntening. The stands shattered into several pieces. So, they could, possibly, attract ligntening, and if hit, they may break. As an alternative, instead of cutting the grader blade pieces at five feet long and welding feet on the bottom, you may cut the square holes and drive or dig the bottom two feet of each seven-foot piece into the ground, in pairs nine feet apart. Then the target backers will not be moveable.